Last week, BTN's editor-in-chief paid a fleeting visit to the French island of Reunion, off the coast of Madagascar, where the only evidence so far as to the disappearance of Malaysian Airlines MH370 just over two years ago was discovered. To put it in perspective, it is now 70 years since American Amelia Earhart was lost on a record-breaking flight over the south-western Pacific Ocean. She was in radio contact until the final moments. The aircraft has never been found. Richard Quest is a fine, responsible and very experienced journalist concentrating on business travel. Starting at the BBC many years ago, he now anchors CNN’s Quest Means Business daily from New York. He is also an aviation enthusiast and follows the airline industry, having interviewed most of the prominent air travel notables over the past three decades. When he was called by the newsroom at 19:30 in his New York apartment on Friday 7 March 2014 advising that a Malaysian Airlines Boeing 777 was missing, little did he know the events that followed were going to embrace his whole life. His book, The Vanishing of Flight MH370, published exactly two years after the disappearance on Friday 7 March 2016, is a true detective story with no ending. Should more wreckage or even the aircraft be discovered, the book will have to be reprinted in a revised form. Reporter, plane spotter and one other very important aspect makes Quest the ideal historian for MH370. 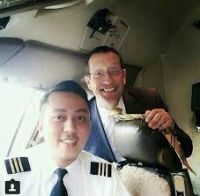 He flew with and interviewed Fariq Hamid, co-pilot of the doomed Boeing, just 16 days before the fateful flight, from Hong Kong to Kuala Lumpur. The Vanishing of Flight MH370 is a fine book dealing with a complex subject that takes real understanding. Quest has lived and breathed the flight since that fateful March day and probably knows more about the event than any living soul. His book is a technical volume that speaks airline parlance while attempting to describe events that members of the public can understand, just like his TV audience. It is very thorough from an operational point of view, dealing with airline customer service and media relations, the workings of the CNN newsroom, and also aero politics. On the technical front, he has spoken to pilots, and those involved with air traffic. Interspersed with the narrative is a history of air crashes and he also points out that airline travel is the safest form of transport, with 939 deaths reported in 2014 against 3.6bn flying passengers. As the tragedy unfurled, he interviewed Boeing 777 captains, Malaysia prime minister Najib Razak and the then airline chief executive, Ahmad Yahya. Quest also covered the Pan Am 101 crash at Lockerbie and the disastrous way waiting friends and relatives were handled at JFK. Lessons should have been learnt, but clearly were not. However, this writer disagrees with how Quest criticises the way the MH370 announcement was made on 24 March, 16 days after the disappearance, that the aircraft ‘had probably crashed’. He seems to think the impersonal text message sent to registered interested parties (relatives and presumed vetted others) in English 30 minutes before prime minister Razak addressed the media was not the right way to break the very bad news. Yes, many of the Chinese kinsfolk were together at hotels in Beijing and Kuala Lumpur, and kith and kin from the other 14 nations represented on board, but Malaysia Airlines did the right thing. What was the practical alternative? There isn't one. Quest discusses at some length his theories on the loss of the aircraft and in one chapter uses the term ‘nefarious’ time and time again, meaning ‘a villainous plot’. He rules out any mischief by the flight deck crew. While he mentions the fateful failure by the Malaysian Air Force in not investigating an unknown aircraft crossing its airspace, there is no real emphasis on this fundamental procedural mistake. There has to have been an investigation, but no results published! What is the use of buying very expensive intercepter fighters and not using them? He cites an example of the Greek Air Force and how it dealt with a similar situation. Richard Quest believes the Boeing 777 suffered a cataclysmic failure in the electronics bay under the cockpit, with loss of pilot control and external communications. There was no chance of a ‘Mayday’ but at least a course change to the nearest emergency runway, Penang, before being overcome, with a passage now set south. The mid-fuselage Inmarsat satellite link to London survived and was able to receive auto messages for another seven hours until the aircraft ran out of fuel and dived into the Southern Indian Ocean sending out one final death ‘despatch’. It is a pure educated guess. Buy the book, a thorough and sad detective tale. But we are still looking for Amelia Earhart. Before being overcome by what? A Mayday was not possible but a course change was? I'd put my money on lithium batteries.